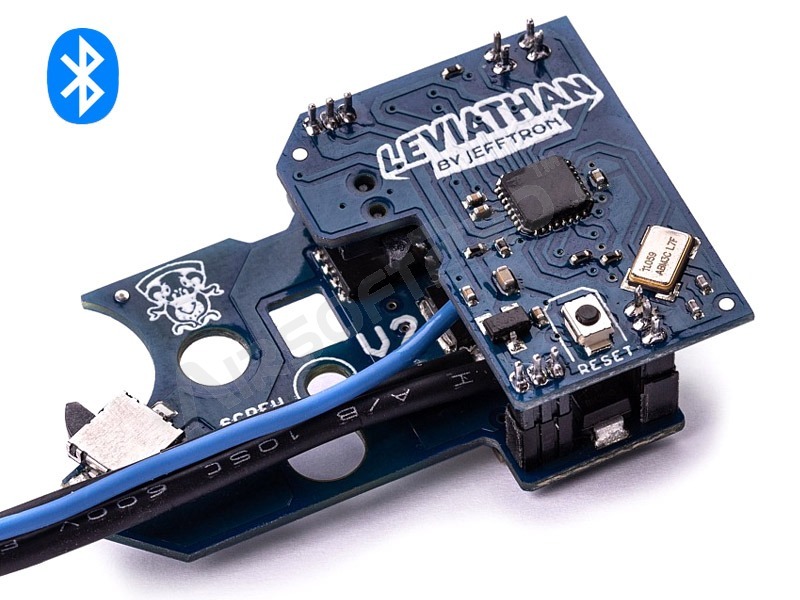 Leviathan - V2 is processor controlled mosfet with Bluetooth communication. 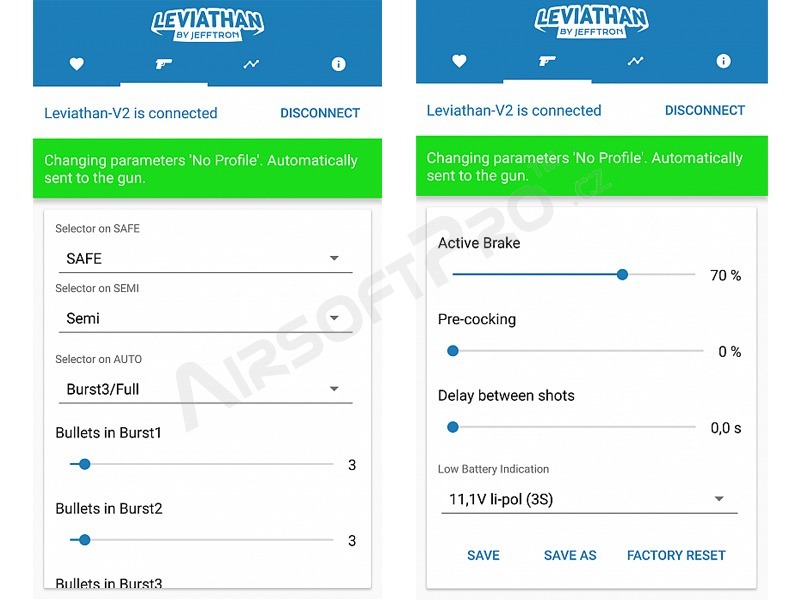 It adds new shooting modes, controls RoF, pre-cocking, active braking, low battery indication, statistics... Everything is controlled via application in the smart phone (iOS and Android). 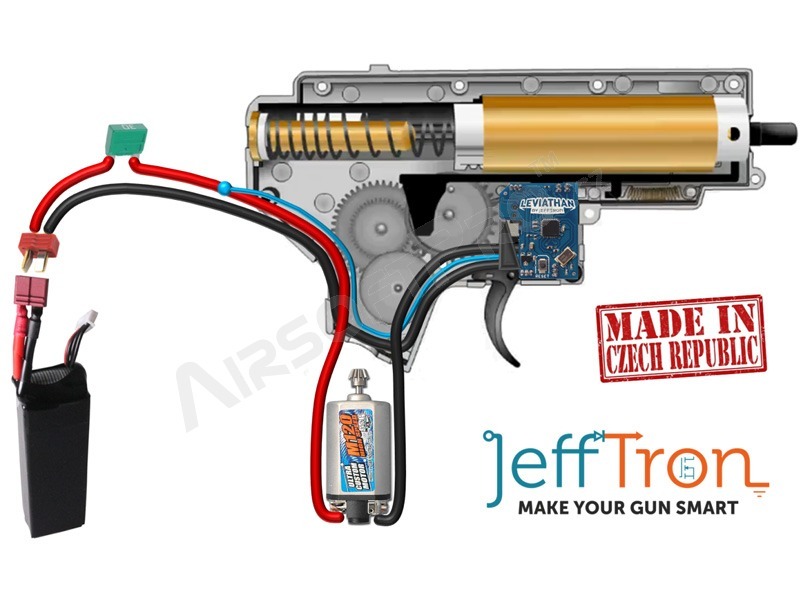 Device is fully integrated inside the gearbox version 2 instead of the original trigger contacts. 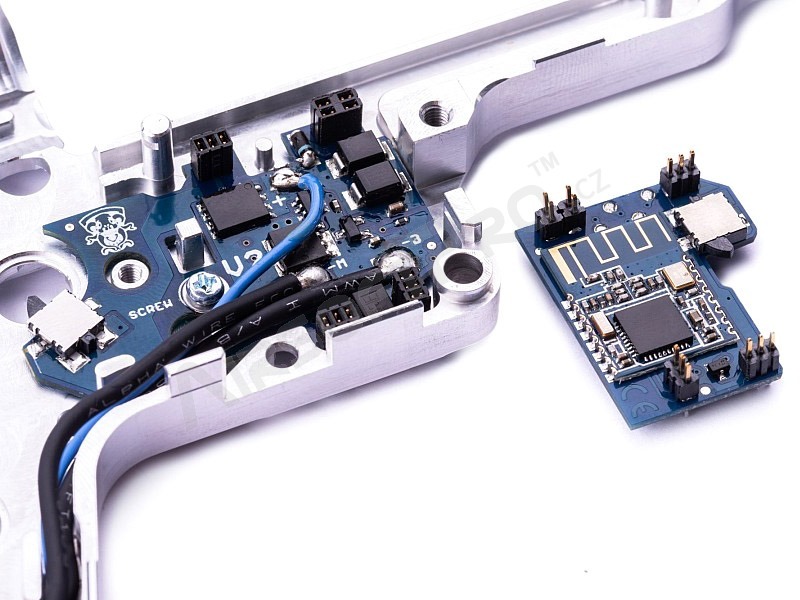 Comes with completely made wires to stock with 30A mini fuse and deanT connector - no soldering needed. Adds new shooting modes independent for every position on the fire selector (SAFE - SEMI - AUTO). Three adjustable bursts (range 2 - 20 shots). Rate of fire makes breaks between shots to reduce RoF. 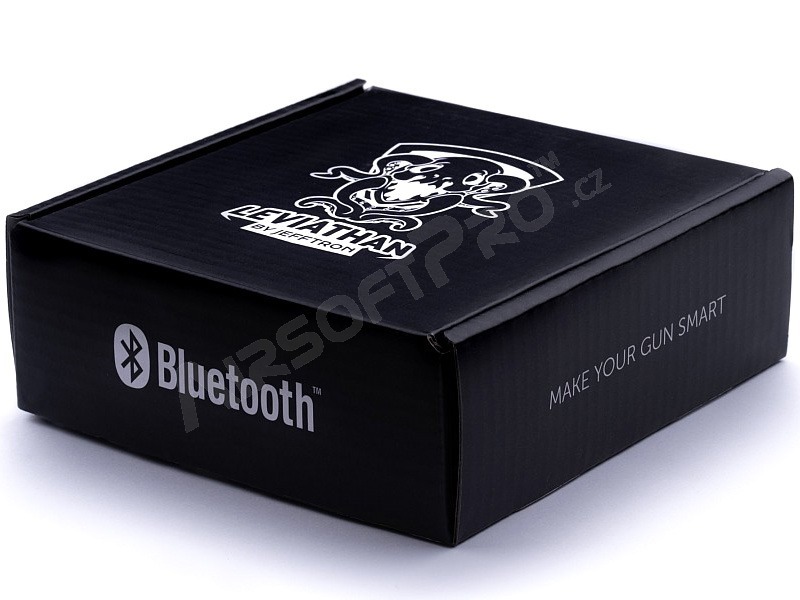 It gives fast trigger response even with very low rate of fire, just like in a real gun. Adjustable strength active braking (can be disabled). Delay between shots adds time in which isn't possible to shoot, it simulates the delay from gun reload or recoil (range 0,1 - 4,0 seconds). 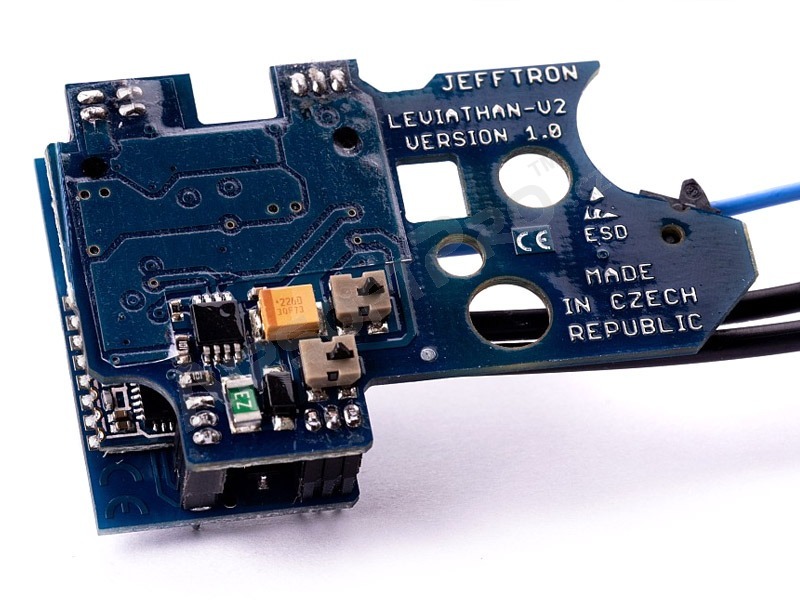 Low battery indication for 2S - 4S Li-Pol and 3S - 4S Li-Fe. Application shows actual battery voltage value. Color lines indicates battery charge status. There are three shot counters. Total count every shot during the device lifetime. User counter can be reset by user anytime. 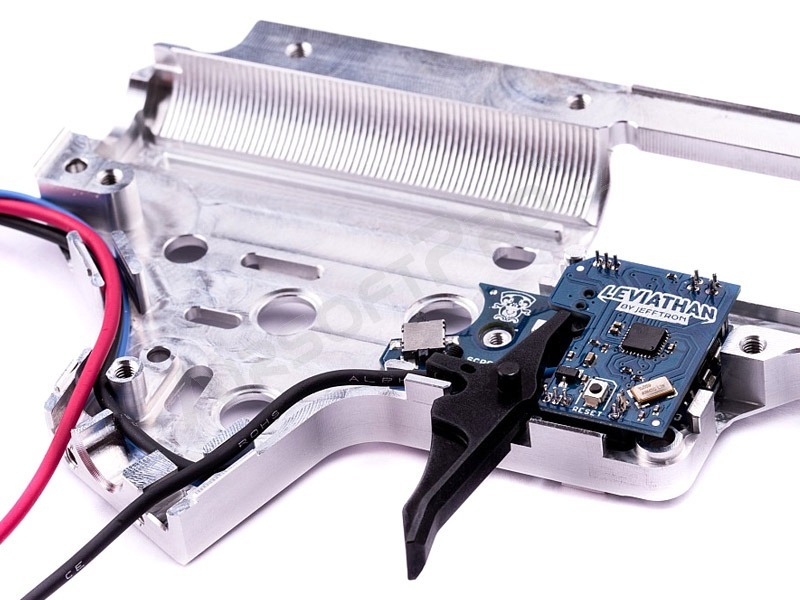 Power-up counter is reset by battery connection. 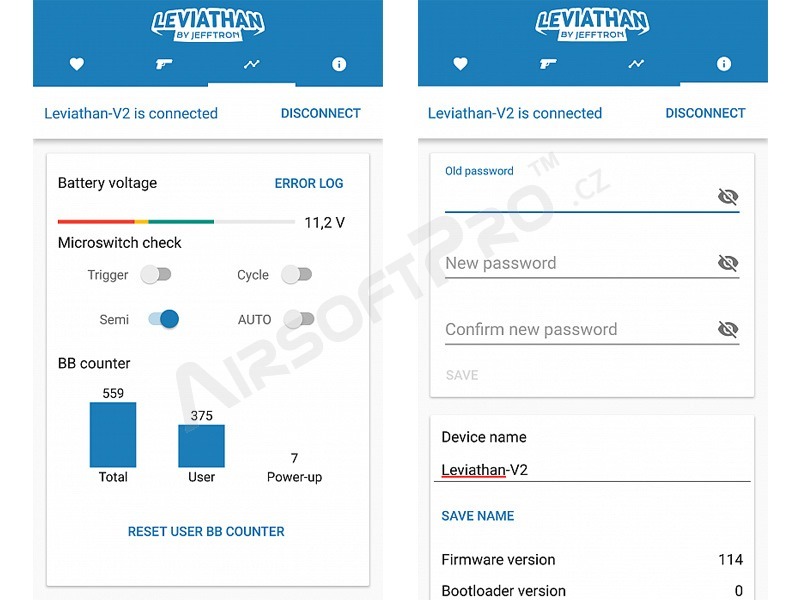 Programmed settings are saved in the Leviathan - V2 memory immediately after their change, so settings aren't lost when is Bluetooth or battery disconnected. 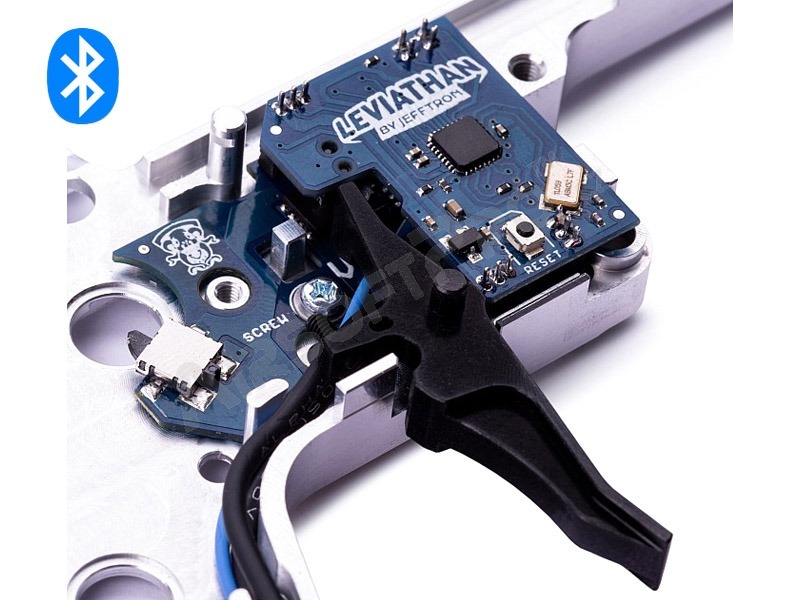 Remove from the gearbox: cut off lever, trigger, trigger contacts and trigger block, you will not need them with the Leviathan - V2. Installation of this device into the gearbox requires advanced technician skills! 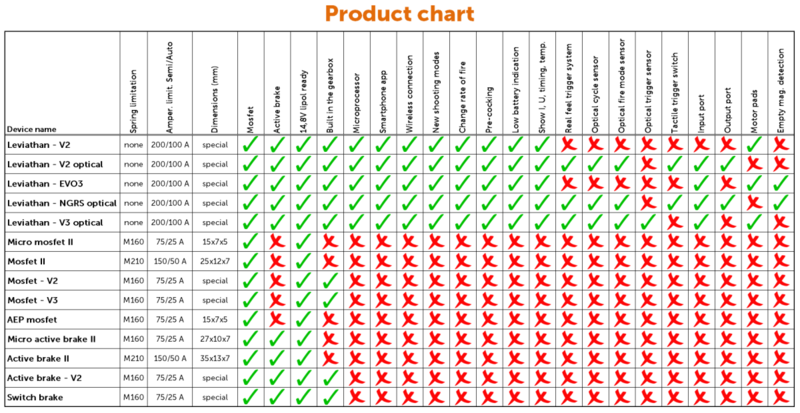 Please read these informations before installing your device to prevent any damage. 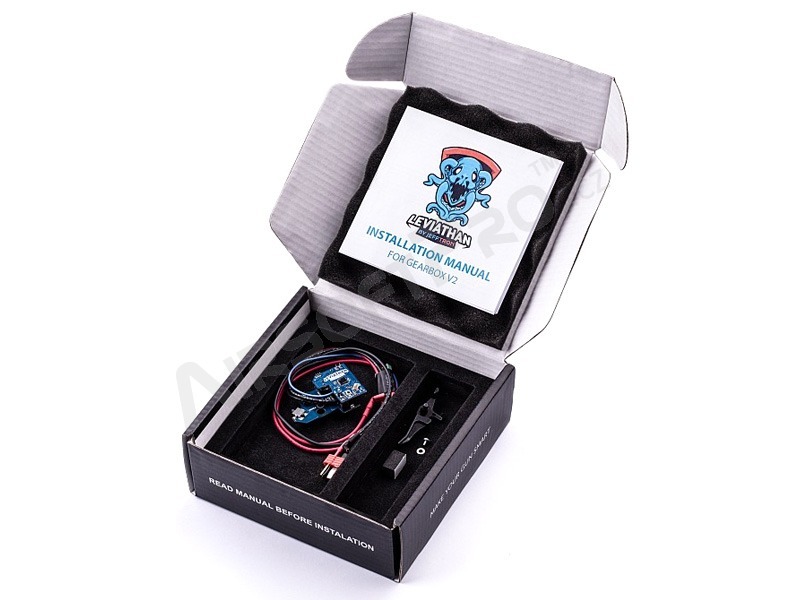 Short circuit or incorrectly connected battery will cause immediate damage to the device which is not covered by the warranty. It can lead to fire or even battery explosion. Disconnect battery, when you aren't using the gun! Otherwise you will fully discharge the battery. Because the device drains small amount of current from the bettery all the time. Don't connect battery when gun pointing towards you, another person or an animal. 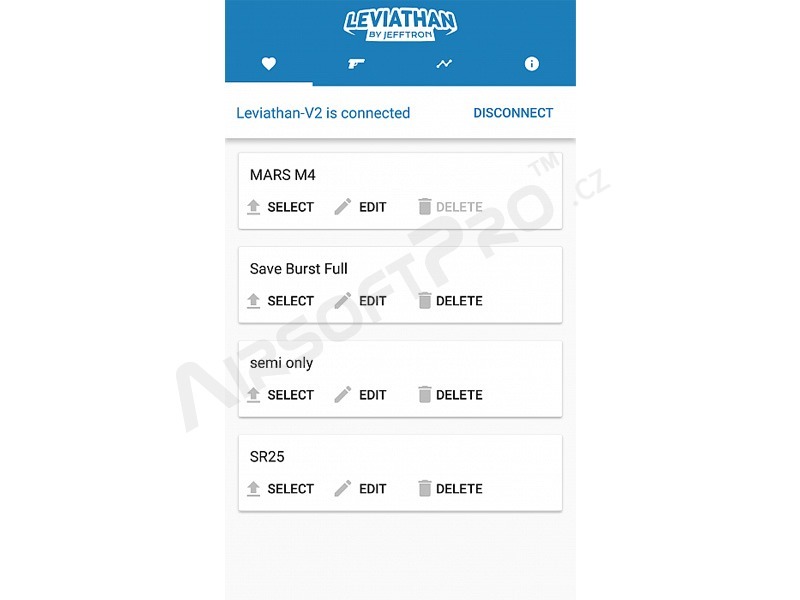 Don't modify, repair and put into any kind of liquids or thermal shock the Leviathan - V2.